Animated Jigsaws: Japanese Women has received a free update that adds two new puzzles + 1 secret puzzle! After the update is installed, two new puzzles will appear on the puzzle select screen in the top right and bottom right corners. In the top right corner is "Beautiful Eyes". Consisting of many similar coloured pieces this is one of the more difficult puzzles in the series. In the bottom right corner is "Relaxing by the beach". 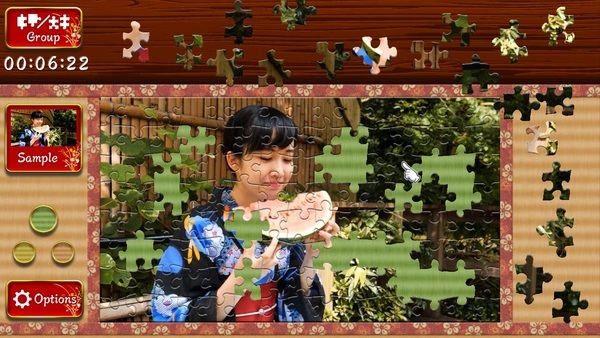 This new puzzle is a little different from the more traditional videos and shows a lady enjoying the cool breeze by the sea. Lastly, there is a hidden puzzle. Try pressing the A Button in various places around the puzzle select screen to see if you can find it! Who says that only young people can beautiful? * After the updated is installed "ver 1.1.0" will appear in the bottom left corner of the title screen.